It's a strange, even ugly, color combination. Solid maroon with lemon yellow type: it looks like PMS 194 and PMS 116. One of the most generic typefaces in the world, Times Roman, set in all capitals, two slightly different sizes, with no particular finesse. The back looks just like the front. Nothing else. Yet, using nothing more than these peculiar - dare I say crumby? - ingredients, the cover of the old Bantam paperback edition of The Catcher in the Rye has the power to move me like few other pieces of graphic design. I can still remember the first time I saw it. It was in the "Young Adult" section of my local library, on a rotatable wire rack. I must have been in the seventh grade. The other books on the rack - It's Like This, Cat; The Outsiders; Go Ask Alice; Irving and Me - all had illustrations on the front, usually peculiarly out-of-date, although perhaps only by months in the fast-moving time continuum of teenage fashion. Punks in leather jackets, preppies in checked button-down shirts and khakis. Handlettered titles for that "youthful" feel. Catcher in the Rye was different. I think the only other book I knew at that point that had a type-only cover was the Bible. Was this book making the same claim to authority? And that title: what did it mean? I had heard, somehow, that Catcher in the Rye was transgressive and quirky, although I couldn't have known then of all the local school boards that had sought to ban it (as they do to this day), or of the self-imposed isolation of its author, J.D. Salinger (which continues to this day.) I took it home, brought it to my room, began reading, and didn't move a muscle until I was done. Of course, I'm not alone in this. College admissions officers are resigned to the fact that, if asked to write an essay on The Book That Changed My Life, the majority of students will pick Catcher in the Rye. Or read the 2,260(!) customer reviews on Amazon if you doubt its enduring appeal. The book does not have that cover now, and it did not have it when it was first published. The dustjacket on the original 1951 edition, designed by Michael Mitchell, had a Ben Shahn-style drawing of a carousel horse dwarfing the skyline of uptown Manhattan, an image clearly inspired by the book's "so damn nice" final scene. Early in its paperback life, I recall it had an incarnation I hated: a drawing of protagonist Holden Caulfield wearing the Sherlock Holmes-style hat described in the book (but looking much dorkier, somehow, than I had pictured him in my mind). Then somewhere along the way (Was it the mid-sixties? My attempts to find a chronology have been unavailing), Catcher acquired the cover it bore when I checked it out for the first time. I've heard rumors, but have not yet found any proof, that Salinger so hated the earlier illustrations that he insisted that the covers of all his books be type-only. Certainly this was borne out by the U.S. paperback editions of his other three books then in circulation. Nine Stories had its grid of colored squares (courtesy of Pushpin); the two Zen-themed books about the Glass family, Franny and Zooey and Raise High the Roofbeam, Carpenters both bore someone's idea of Asian-flavored lettering. But for me, the maroon cover of Catcher has a special place. Blank, enigmatic, vaguely dangerous, it was the perfect tabula rasa upon which I could project all my adolescent loneliness, insecurity, anger and sentimentality. It was as if possessing it provided a password into an exclusive club, even if that club existed only in your own mind. I wonder if a different cover, a more "designed" cover, could have been able to contain quite so much emotion and meaning. Well, Catcher in the Rye has a different cover now. More than ten years ago, its publisher did what any intelligent marketer would do. They created a Unified Look and Feel for the Salinger Brand. Now all four of the paperbacks have identical white covers, identical black typography, and - here my heart sinks - a little sash of rainbow-colored stripes up in the corner. No horrible pictures of Holden and his hat, thank God, but those happy little lines just seem to be...what? I guess they're trying a little too hard for my taste. As Holden Caulfield might say, the new covers just look phony. The old one was just so goddam nice, if you know what I mean. Is there a particular reason or idea behind the current covers? Type-only is one thing, but I just think they're nasty. I've always had a particular hatred of them. They make me think of the generic products I used to find so morbidly fascinating at the supermarket in my home town. We're not even talking store brand here. These were plain white boxes or labels with PEANUT BUTTER, CRACKERS, etc. on them in something that was probably Helvetica. As for the book itself, I remember reading it in high school, I think, and wondering what all the fuss was. Maybe I missed something, but I've never felt much inclined to go back and check. What a gorgeous, heartbreaking, bittersweet piece, Michael. I will never, ever forget the moment I first saw the cover you are referring to. I was in high school and it actually gave me goosebumps. I remember being almost afraid to pick it up, it so moved me. I still can not look at a carousel and not think of Holden and Phoebe and everything being so damn nice and complicated and terrifying. Sigh. Certain visuals are like timepieces for me, and instantly bring me back to a particular emotion I experienced for the very first time--and it always feels the same: immediate, riveting and deep. Often, I can also remember what I was wearing when that happened. What music I was listening to when that and that happened. Patti Smith's album Horses, with the extraordinary photograph by Robert Mapplethorpe, had the same effect on me as the Catcher cover. That also changed my life. It always interesting to me that whenever anyone brings up the book, the first thing that comes to mind is not the story but the cover. And you know, I really don't think I've ever thought twice about until now. And I agree with Michael. In it's sheer simplicty, it sent a message that it was unto itself. It sent a message that was understood by the generations that have been able to relate to the cover and the entranced by the story, that as Michael points out, graces many a college entry essay. I remember the other books he mentions, especially The Outsiders, that were of that 'tough, street-wise" genre. 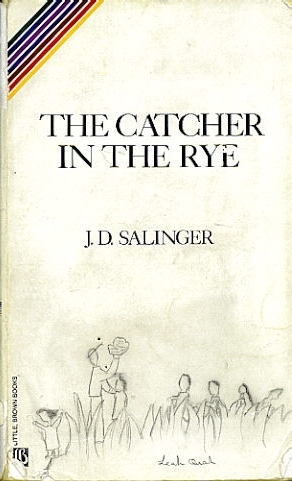 It was a great fantasy world but Holden Caulfield, in his own way, connected to my life in a much purer form. Maybe it was my own adolescent awkwardness but it is a read I still enjoy returning to every now and then. And a cover that obviously influenced me without my even thinking about it in that way. I'm currently reading God, A Biography by Jack Miles. One of the reasons I was attracted to the book was the no nonsense cover, all-white with the word "God" prominently in black, effectively saying that this book may be about God, but it's a book of scholarship, not worship. 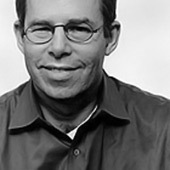 A few days ago, I happened to be reading the back cover and noticed the cover designer: Michael Bierut. Catcher in the Rye was a good influence indeed. When I first saw that white cover, I was outraged. How could they do it? Fine for "...Roofbeams" and "Franny & Zooey." But not for "Catcher." When I first saw the illustrated cover, on the hardback edition in my college library, I was completely befuddled. How had such an atrocity ever been printed? How could they put a face on a guy I'd already pictured? How could they dare? "Catcher" is probably one of the few books I remember gigantic chunks of. Scenes, bits of conversation, all of it. Mao had his little read book. "Catcher" was mine. You people are classic! I laughed out loud at my screen - completely psyched that Steven then brought up my no. 2 all-time fave, Nausea. Thank you Michael for sussing out the deeper implications of how that cover snapped your eyes. I got mine at my favorite bookstore Micawber Books in my home town of Princeton. I had always thought it was the practically beveled edges and the cloth-like texture of the cover that attracted me - the use and history it had accumulated before it found its way into my hands...I now have a new take on its searing visual (not just tactile) qualities. I had read it in eighth grade (which for me meant the rainbow/white cover that was mentioned) and only when I reread my Micawber copy three years ago did the story actually impact me. And honestly it had everything to do with that evocative cover...even now I'm getting all cozy and reflective. Yeah man - that little article is solid gold. Several cover images, for the curious: first edition, cheezy 1961 "Sherlock Holmes" cover, Modern Library cover, the "rainbow/white" cover, Penguin paperback, grey cover. I think what's so wonderful about The Catcher in the Rye cover isn't its visual appeal, but rather what a reliable fixture it's been for so long. There's something profoundly comforting about seeing a kid on the subway peeking over that crimson cover, and knowing that he's having an experience just like the one I had one afternoon at summer camp. Knowing that Michael and Steve and millions of other experienced the same book I did, down to its barest physical attributes, makes it all the more special. I hadn't realized quite how powerful the cover was until thinking about how little I'm moved by seeing others read different editions of books which I hold even dearer. Here's a few more covers. Here's a bit of history on Penguin. All there covers from the 30's 40s and 50's are classics of design IMO, using just clean Gill, colour coding and the occasional 2 colour line art illustration. You still see today I think that UK book covers do tend to be more direct and simple visually than equivalent US book covers. I notice US covers use more serif's and more covers have titles with lots of letter spacing. Thanks to everyone for the great comments, and expecially to Andy and David for the links to other CITR covers. It's interesting that all the illustrated covers are uniformly mediocre. I was wondering whether the qualities I admire in the crimson CITR cover are linked forever to an "undesigned" aesthetic, or if they could be consciously evoked by a professional designer. Then I thought of Peter Saville. Much of his work has exactly that kind of open-ended "blankness" that suggests but doesn't dictate a specific reaction. I remember buying the 12-inch of "Love Will Tear Us Apart" by Joy Division and staring at some time at its (uncredited) cover design: classical lettering above a black-and-white photograph of a statue. Even knowing nothing of bandleader Ian Curtis's suicide, the combination of song and graphic design projected a powerful sense of dread. It may or may not be a coincidence that the audience for both Catcher in the Rye and bands like Joy Division are self-absorbed, alienated young people. Perhaps designing for insular subcultures requires the skill to fly just beneath the radar. Thank you for this post, Michael. For me, the maroon cover has a timeless, classic quality about it that the current white cover just doesn't have (even the Penguin covers Andy posted seem more appealing). I also remember "The Outsiders" cover from that period. I, too, first saw these books at my local public library. Unlike "The Outsiders", though, which I read in my teens, it would be a long time before I read "Catcher in the Rye". What a great book! Probably the best I've read ever. (and I've read it quite a few times). Andy Baio's cover history links are great. The first one I ever read was like the last one he posted, the grey cover one, but it was red. Now I own a deluxe version with the first edition cover. Great post about a great book! The original 1951 cover with the carousel horse was reissued in 2001 by Back Bay Books (an imprint of Little, Brown and Company). It's rather nicely done, flips beautifully in the hand, and feels like an old edition. I bought it for my daughter who's reaching the age when it will make sense. A wonderful essay, Michael, that captures the book on formal and humanistic terms. I've three copies of The Catcher in the Rye myself, but for some reason have never been able to limit my library to one. I only purchased one of the copies--the maroon covered. It is weathered from multiple readings, with pages smudged from my greasy fingers. In subsequent years I've been given additional copies as gifts: Little Brown's original 1951 hard cover printing (without the dust jacket) and their 1991 reissue with rainbow (I can never get past comparing it to a Beatles album). I favor Bantam's maroon copy. Its colors are emblematic of Holden; the deep red brown reflects the tone of the book, somber and lonely. Similarly, New Order's Substance holds a special place on my shelves. Like The Catcher in the Rye, its cover contains typographic form without visual imagery, allowing the content to speak for itself. Moreover, I craft my own images of what lies beneath the cover's surface without an illustration or artist's rendering spelling things out. When I recall a song from Substance or an incident from The Catcher in the Rye, the covers leap to mind and compel me to search my shelves, pull them from the stacks, and cradle them. I understand what you're saying, Michael, but I remember having the opposite reaction back in high school. It must have been 1987, and the maroon and yellow cover was still being used when our English teacher distributed the paperback to class. I distinctly remember forming a grudge against the book before I even read it. The sour color and graphic austerity of the cover just seemed so portentous, telling us that this book is IMPORTANT! Like most teenagers, I didn't want to be told what to think of something before I experienced it myself. (The Psalter-like covers currently in use don't seem much of an improvement.) I remember having a more positive reaction to another class reading assignment, Scott Spencer's Endless Love which was still being distributed (in public schools, anyway) in the movie tie-in cover featuring Brooke Shields. This seemed so much more daring. The movie was a bomb! But the book was so good, it didn't care! On the other hand, as a teenager I also loved Peter Saville's New Order covers, yes, but there the austere trappings on what were essentially disco records seemed truly subversive. I was issued the rainbow covered version in high school and, like many others, the book struck a cord with me. It wasn't until years later I saw a friend's version of the maroon with yellow type, and I audibly gasped. There's something about a text, especially one you know you love, wrapped in a fabulous cover. I was surprised to see Catcher at only #13 on the American Library Association's list of 100 most challenged books. The times they are a-changin? It's interesting reading the thoughts here. When I read Catcher it was in the white-with-black-text cover stage, and to me it seemed like a book of huge importance based on the fact that it didn't need a fancy cover. However, when I look back at other covers, like the maroon and yellow cover, I feel a little disheartened, I feel as if by reading it I will have a different, somehow lesser experiance because it isn't my Catcher, the cover is too plain. I think the reactions here are based on how one connected with the text, and then how that person connected their feelings to the cover, like brand recognition, if you will. Great post, btw. Michael, the "Love Will Tear us Apart" cover - and all Joy Division covers, as far as I know - were designed by Peter Saville. It's one of my all-time favorite covers. When I first saw the redesigned white cover for CITR, my first, immediate thought was: "They did this because of Mark David Chapman." Because of the connection between the book and John Lennon's killer, I felt that the publishers were trying to distance themselves from that entire horrible event. A way of "washing their hands" clean of any involvement, I guess. I could be wrong, but it was my first thought. In all publishing contracts for Salinger books it is specifficaly required that no illustrations should be used and that always title of the book should be above name of the author, title set in bigger type. Also, publishers are requred to send cover design for approval before printing - whether JD himself checks them all is not known. 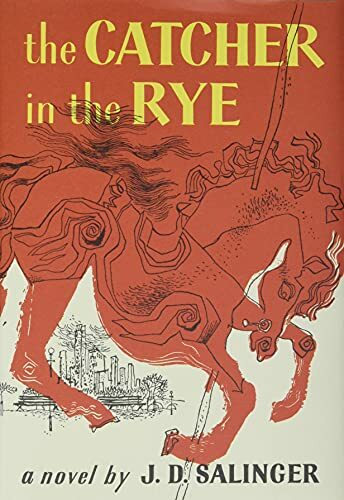 As a high school student currently nearing the end of this long ordeal (much like the hated compulsory Religion class, Catcher in the Rye was something I didn't like but which made me think all the same), I had to investigate the cover and find out what the one with Holden's illustration was. Thanks to the links provided here, I found two. Both were disappointing. At school, we get the white covers in various ivories and beiges; I like it because it allowed me to draw on my own cartoonish illustration, but no one else has taken the blank space as a canvas.The rainbow stripes are hideous, but at least it keeps it from being too plain. When I first started reading the book, it was my aunt's red-and-gold (as I see it, anyway) paperback, which I started right away because plain covers arouse your curiosity and... well, I really did like the colours. I am currently working on a school research project centered on J.D. Salinger. If anyone stumbles across this and would like to answer a few questions, i would be very appreciative. Mainly, if you would like to tell me in what ways you feel Salinger's work has affected you personally, how his books make you feel, or what you believe makes Salinger a classic author, i would be, as i said, forever in your debt. If you wish to reply to me, just post on this website with your thoughts. Thank you.